Manila (AFP) – The Philippines has banned companies from compelling women to wear high heels to work under a government order hailed by a labour group Monday as a victory against sexism and pain. The labour department order took effect on Sunday as the government took up the cudgels for long-suffering shopping mall clerks, hotel receptionists and flight attendants. Employers should implement the use of “practical and comfortable footwear” to improve the health of workers who stand for long periods, said the order, which applies to heels measuring 2.54-centimetres (one inch) or higher unless the employee chooses to wear them. “It’s a form of torture. It’s a form of oppression and slavery. Imagine having to endure that pain for eight to 10 hours a day,” Alan Tanjusay, spokesman for the Associated Labor Unions, told AFP. 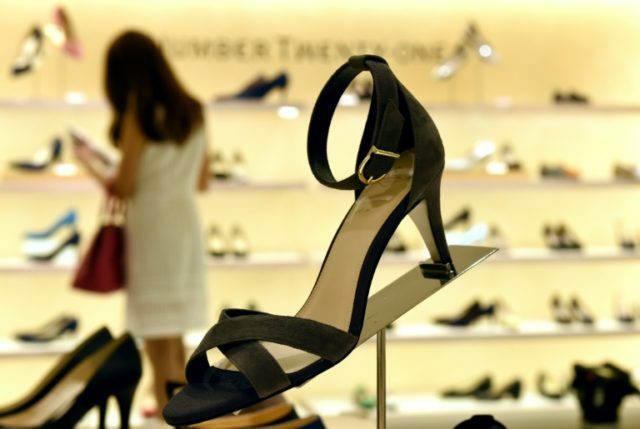 The department order said female sales clerks and security guards who had been compelled to work in high heels suffered from sore feet, aching muscles and “hazardous” pressure on joints. “These (work shoes) should not pinch the feet or toes; are well-fitted and non-slipping; provide adequate cushion and support to the arch of the feet; either flat or with low heels that must be wide-based or wedge type,” it said. The labour department also ordered companies to give these workers rest periods or seats to reduce the time they spend standing or walking. Tanjusay said unions lobbied the labour department last month following complaints from saleswomen, hotel receptionists and flight attendants. Malls are a mainstay in the Southeast Asian nation, mainly employing women as sales clerks, cashiers and so-called “promo girls”.